The following reports are gleaned from our APD Zone 6 crime stats for weeks 20 and 21 of 2009, with emphasis on our Beat # 603, but with news from around the Zone as it pertains to us. 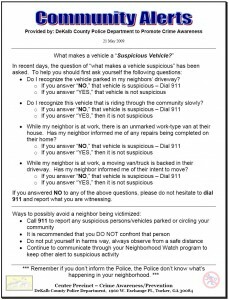 Please read these reports with an eye as to how you can alter your daily activities to avoid being in a situation for criminal activity. Aggravated Assault – At Dugans Bar on PDL Avenue one patron struck another patron for seemingly no reason. Auto Theft – At the Papa John’s pizza store on Piedmont Avenue, an employee left his keys in the ignition while he was preparing to make deliveries – and guess what? Week 20 had no auto thefts – but week 21 was a different story. Cars were stolen on Arlington Place, Greenwood Avenue (the victim saw his car being driven off), Rosedale Drive (this was found on Virginia Avenue), Virginia Avenue (2), PDL Place, and on Virginia Circle a red Jeep was stolen for the 2nd time in a couple of months. So much for my previous advice about chaining up small motor scooters – thieves just cut the chain used to secure one in a Ralph McGill parking garage!! But – at least the chain really made them work harder to get the scooter. Commercial Burglary – At the new storage facility being built on PDL Place – tools were taken from the site and the perp tried to sell them to the owner at the PDL Avenue McDonalds – somehow he managed to take them from the perp and discovered the breakin when he got to PDL Place that morning. The public storage facility on Cheshire Bridge Road had a lock removed from a unit and items were stolen – the storage facility in Kanuga Street also had a unit robbed. At the Atlanta Vision optical store in Edgewood entry was made via a smashed glass front door with $14,400 worth of frames stolen. Commercial Robbery – My Dry Cleaners on Moreland Avenue in L5P was robbed at gunpoint – the second time in just months. Larceny From Auto – This is an area where we all can make a difference and free up officers from having to spend so much time writing up these reports. Keep your own car cleaned out of “stuff” and most importantly, warn your visitors to clean out their cars before enjoying an evening here in VaHi. If you are in the hospitality or retail business especially – warn your patrons and ask them to return to their cars if they think they might have items left in plain sight. You are doing them a favor!! Cars were broken into on Amsterdam Walk, Adair Avenue (this perp was caught by a patrolling officer!! ), Arlington Place (2), Drewry Street, Kanuga Street, North Highland Avenue, PDL Avenue (2), PDL Place, Amsterdam Avenue, and Cooledge Avenue. On Todd Road, the victim, while waiting for a friend to come and help change a flat tire, talked to a guy with a “security” baseball cap on – he left the car for a short time and property was missing. Of these 13 incidents – 7 of the owners were from outside of VaHi. All around Zone 6 in this time period – 13 GPS systems were taken, 4 in-dash stereos ripped out, 5 license plates taken off, 3 handguns taken, as well as scores of laptops, cameras, cell phones, I-pods, etc. Larceny Other – Diamond earrings were missing from a Virginia Circle residence after an exterminator’s visit. At the Edgewood Wachovia parking lot at 10:30 a.m. on a Monday – 3 deposit bags were taken from under the victim’s arms – the victim gave chase, but the perps escaped. If you are making business deposits – alter your timing and your route to the bank, and conceal the bank bags somehow. Otherwise you are a sitting duck as was this victim!! At the Starbucks inside the Ansley Kroger – a customer was having coffee when the suspect asked her to read the fine print on a package of sugar – she later noticed she was missing $750 from her purse. The PDL Avenue Blockbuster got shoplifted. Lawn equipment was stolen from a trailer parked in front of a Drewry Street residence – the owners had gone to the back yard for 5 minutes!! A bicycle was stolen from a storage area in a St. Charles Avenue apartment building. An unwatched purse was stolen from a St. Charles Avenue front porch. The Edgewood Target caught 3 shoplifters and the Krogers in that same center caught 6 shoplifters. Pedestrian Robbery – Yet another h/m was robbed at gunpoint in a Woodland Avenue parking lot at 5:50 a.m. On 5/10 at 1:50 a.m. on Seminole Avenue two twenty-something males were robbed at gunpoint by 2 b/m – and on that same street on 5/14 at 3 a.m.two females were robbed at gunpoint by two b/m. At the Edgewood Kroger parking lot on 5/10 at 9:15 p.m. a lone female was robbed at gunpoint and also lost her car to a b/m and b/f. Residential Burglary – On Lanier Boulevard entry was made via rear double doors being pushed in. A witness gave chase as the perp left on a bicycle – but lost him. All over Zone 6 in this time period 11 doors were kicked in to gain entry to residences. Thanx to Joy Rousso of Atkins Park for passing this notice on to me from DeKalb Police – the same things apply here in the city also. You might want to print this out and keep it on the refrigerator door to remind yourself every once in a while. 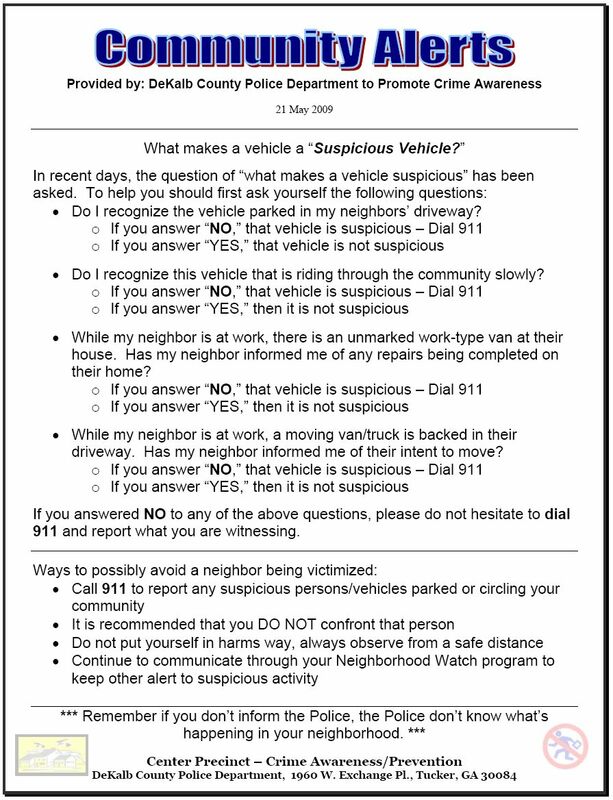 Suspicious persons and activities 911 calls do make a difference!! Be alert and be safe!